We received a request from a client where they wanted to implement an expanded order grid while still keeping the default Magento’s one. 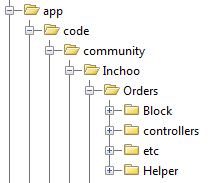 For this example we’ll create a new module named Inchoo Orders. Next thing we’ll do is create folder Inchoo/Orders inside app/code/community and inside we’ll make few folders: Block, controllers, etc, Helper. Create config.xml inside etc folder. Create adminhtml.xml file inside etc folder which will add a link to our orders page in magento admin panel. Next step is to create controller for our grid. 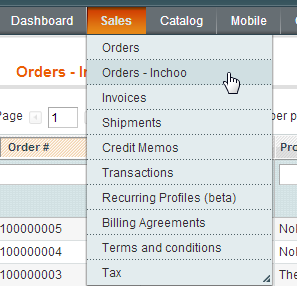 Our new custom orders page can be accessed by going to Sales -> Orders – Inchoo in admin panel. However, if you’re having trouble with Magento development, we would be happy to help. Our team of experts can check out your site and get you a detailed report based on a personalized technical audit. Feel free to get in touch!
. If I comment out the line, I have at least Magento Header and footer and blank white between. So there’s something with the function or the Grid.php. Version is 1.9.0.1. What have changed? Hi thanks for the tutorial I followed all steps exactly, refresh the admin page but no ‘Inchoo Orders’ item appearing under Sales menu ? Is something else needed (cache clearing / smth)? If yes, can you include it in the tutorial ? Working great thanks. I have a dought. Now i am able to see custom grid, instead of sales model i need to display my own table values into it(Product faqs). I have a product faqs table, i need to fetch from this table and display. How can i do this please someone help. Regarding ” 404 Page Not found”.. Resolution for 404 Page Not found is to move your controller to adminhtml folder with-in the controllers folder. hello guys help me in step 5. I have followed all steps and Order – Inchoo sub menu is there in Sales menu but when I click on it, it leads to 404 Page Not found. could you tell what is the missing part.. I have checked it lots of time. what is the importance of this function..? There are a few tweaks you can make that are helpful, including the ACL one you mentioned. I added some to a GitHub Repo a couple years ago if you’re interested magento-admin-custom-sales-order-grid. The ReadMe shows what edits I made. How to make the row clickable , I mean, I used getrowurl for it but I want to make a custom sales_order/view block inside incho_orders module. how can i do that? Nice tutorial, but what should I change if I want to use a different link than adminhtml/order/ for the grid? So okay I found it. Would be nice if this was clearly mentioned in the tutorial. For those of you who were also looking for this, in case if you want to add several custom grids, or you just want to have it a more suitable name. You CAN change the url route for the grid. So for example if you want to change “adminhtml/order/” to “adminhtml/mygrid/”. Of course make sure you change the class name of the controller as well. That’s it. When filter_index value is added to MySQL query it is wrapped inside “, what makes SQL error. "(SELECT GROUP_CONCAT(' ', x.name) FROM sales_flat_order_item x WHERE x.product_type !='configurable' AND main_table.entity_id = x.order_id ) LIKE ?" Hi, Thank You the code .. Please Help Me i got a error Call to a member function setSaveParametersInSession() . Please give a guidance for it .. I followed all steps you defined above.But when i click on “Order-Inchoo” it shows 404 error.why? It’s is possible to add the acl role capabilities to this module ?